Alpine wine brings to mind a light-hearted, playful nectar. Cool, light and snow-white, mountain vintages, like old mountain folk, live by the maxim that patience is a virtue. Time is needed to discover, step by step, the surprising savours of rare vines and the subtle harmonies of limited productions. Alpine wines are worth a visit. In the many folds and nooks of its 4 808 metres, Mont-Blanc is home a few marvellous vineyards that Maurice Messiez took the time to visit, one by one, with the slow, careful attention of a wine lover and the penetrating vision of an expert. A three-part portrait of some very surprising wines to be found in France, Italy and Switzerland. Could it be that the Allobrogica, which Plutarch noted as being « appreciated by the Romans », is the ancestor of the Mondeuse, now a traditional part of « raclette » meals in ski resorts ? Travelling as our ancestors did, a pack over the shoulder and walking stick in hand, remains without a doubt the best way to discover a region. 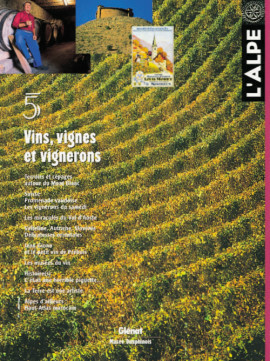 Particularly when the region in question, overflowing with vineyards, clearly invites you to taste the local wines… On the trail to discover the vintages of the Vaud canton. Under the clear sun of the vendanges in Prébois, there is a tinge of winter shadows and death. This text, originally entitled « Notre vin » (Our Wine), is part of a collection of short stories written by Jean Giono in 1948 in Lalley, a village where he stayed regularly. The landscape and the inhabitants of the Trièves inspired a number of novels and this series of texts that the author had originally planned to publish together under the title « La chose naturelle ou rien dans les mains » (The Natural Thing or nothing in our hands). Kings delighted in them, the secret and voluptuous wines of the Maritime Alps. Nestled in the folds of the abrupt slopes just north of Nice, a number of small vineyards continue to produce relatively confidential local wines. Bellet, Villars and a handful of others are authentic Alpine delights enhanced by the savours of the nearby Mediterranean. Wines just waiting to be discovered. Scaling the steep slopes step by step over abrupt terraces, skimming over stony pergolas, roaming around the châteaux, vines have always been part of the landscape in the Val d’Aoste. The many wines to be found in this magnificent valley are a pleasure indeed, highlighted by a number of rich local specialities. The quality and variety are the product of an enormous amount of work, carried out jointly by the regional institutions and a number of small, but dynamic vineyards. Austria, the Alpine Republic, is known above all for its wines from the flatlands… However, some real treasures remain to be discovered on the eastern edge of the Alps, where the sheer snowbound peaks gradually bow down to become rolling hills. Alcohol, slopes or the difficulty of a climb ? In the Valteline, the vines march up the steep slopes and grasp at the slightest ledge. The vineyards here are a striking example of Alpine wine-growing conditions. The region lies to the north of Lake Como and, through long-standing tradition, produces quality wines that are not for the faint-hearted looking for a standard taste. The wine was good and the region spread over the Slovenian Alps was declared a promised land. It must be said that here, the wine-growing techniques were not influenced by the Romans and the wines have their own particular character. A panorama. Shifty characters, nomads… were the terms used to describe the Valaisian mountain folk who descended from their high pastures to grow a few vines on small plots on the lower slopes of the Rhône valley. A rough life, on the move, and countless hours of hard effort for the simple pleasure of drinking the precious beverage among friends. These amateurs made their mark on the slopes of the valley and particularly on mentalities through their ancestral devotion to a particular form of (viti)culture. To provide a break from excursions in the Alpine vineyards and trips to wine cellars, a closer look at the history and traditions of wine-growing in the Alps is the means to better understand an ancient culture that is still alive and well today. Throughout the Alps, a number of museums are dedicated to wine. A short visit to these sites created in honour of Dionysus, the god of fertility. « Yellow » wine is a source of inspiration for many wine lovers. This nectar from the Jura mountains, with a truly unique taste, is the result of a very special vinification technique and a type of vine, the Savagnin, whose cousins prosper on the slopes of the Valais canton in Switzerland and in the Haute-Savoie region in France. Can a particular type of vine originate in a number of different places ? Claude Royer sheds light on one of the mysteries of wine ethnology. Are vintners the guardians of the landscape ? What is the future of Alpine wine growing ? Mario Fregoni is in favour of a system that would put the accent on people, the landscape, our heritage and the production of quality wines, even if short-term profitability must suffer. The major question is who will pay ? The innermost regions of our planet are in constant upheaval. But the geological time scale is not that of men and the few spectacular events demonstrating the Earth’s tectonic force that we may witness over the course of a life are truly nothing in comparison with what the Earth has created over the last several billion years. Bernhard Edmaier, photographer, wanted to pay homage to the artist by making the effort to discover unknown aspects of the Earth. The heritage of Moroccan mountain dwellers was until recently preserved in the surprising granges in the form of citadels, whose hieratic silhouettes may be observed on the summits of the Atlas range. A guided visit. In the southern regions of Morocco, particular attention in paid to doors. Whether for a house or a grange, they reveal the wealth and the lofty spirit of the owner, as well as the forces he invokes to protect his possessions and his family. The grange sanctuary, both hermitage and tomb for the guardian of the souls (and possessions) of the mountain inhabitants of the Aït Bouwgmmaz valley in the High-Atlas mountains in Morocco, bears witness to surprising architectural know-how and also a culture that is on the road to extinction. Images of summits in Byzantine iconography are governed by unchanging canons that nonetheless allow for a certain margin of artistic liberty. From the Russian steppes to the Vercors cliffs, an initiatory journey in orthodox imagery.